We use the term “enterprise model” rather than “business model” advisedly in this context because the purpose, content realm, and community to be addressed matter deeply to revenue models. That’s what’s so fascinating about INN’s latest report; it takes an emerging field and sorts some of the variables that make a difference to their models—and that is nothing less than gold to practitioners. The interesting thing is that it is no less useful for being mid-development. 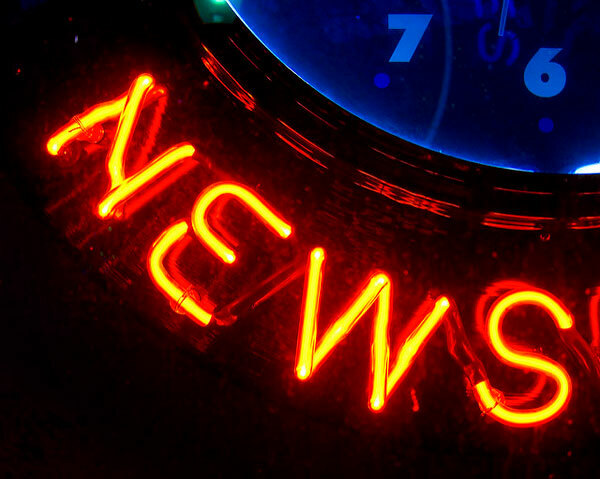 The nonprofit news field as a whole is very young. Only 25 percent of the organizations started before 2008, and most are around eight years old. To provide a sense of the range, half of these organizations are running on less than $500,000 annually, and only a third have budgets of $1 million or more despite the outsized effect they have had on the news. This is growth, since two years ago, only a third of those surveyed topped the $500,000 mark. Of course, cash is not the only type of capital used to start nonprofit news sites; one can only vaguely imagine the value of the sweat equity that each of the 88 groups surveyed brought to bear in their run-ups. These organizations’ relatively low budgets likely reflect their youth. Although some outliers started with the silver spoon of one or more high-net-worth donors in their mouths, the range of the budgets overall shows markers of growth in the field. The report points out that not only are the more mature organizations showing higher revenues, but the newer ones are starting with a more diverse set of revenue streams under development. The report’s authors speculate that the accumulating knowledge base about what it takes to generate revenue in each area may provide a faster trajectory toward financial stability. One of the main drivers in these enterprise models is audience size and attachment, and that generally builds over time. It is therefore a good thing that the primary revenue source for many of these new news sites is still philanthropy, which rings in at a healthy 57 percent average over all of the types. The sites that rely most heavily on foundations are single-issue sites like The Marshall Project, which are often effectively started by a high-dollar donor or institutional philanthropy. EdSource is more than 90 percent dependent on foundation funding, and considering the number of large national foundations that are invested in education, that may make some sense in terms of stability even if it raises questions about independence at the same time. Local news tends to be more dependent on a variety of sources, with local and regional publications having higher advertising bases. 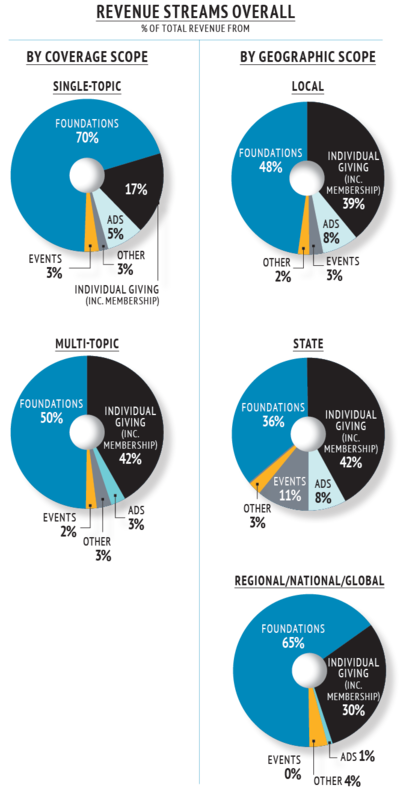 Membership revenue and small donations make up a remarkably healthy portion of the budgets of these organizations, and funders like the Democracy Fund, the Knight Foundation, and the MacArthur Foundation have established a matching fund to help them as they push to expand upon the current base. (That’s another a significant benefit of the kind of information being collected by INN, by the way—funders can support strategic actions aimed at sustainable revenue based on real data.) Other sources of revenue include syndication and events. Perhaps unsurprisingly, the startup phase can be very difficult without an original capital infusion. News startups tend to invest first in editorial, but INN has found a strong correlation between investment in staff dedicated to earned revenue generation and…well, generation of earned revenue. It found that outlets with no dedicated revenue-generating staff generated less than $200,000, but those with one to three employees dedicated to revenue growth generated a median of $900,000. The study observes that the preference of many funders for lean operations and quick turnarounds on revenue generation retards some of the progress that might otherwise be made, and that is not made better by the expectations of charity watchdogs that fundraising and operations stay within certain limits, no matter where you are in developing your model. There is more in this report that is incredibly useful for practitioners and for funders of infrastructure in various fields, but we will stop here—with the exception of one major point. As many of our readers know, the news industry has long been plagued with a lack of diversity, and one would have hoped that in building a whole new field, we might be seeing some new demographics. That’s not the case; a graph shows that 73 percent of staff are white, 9 percent are Asian, 8 percent are Latinx, and 7 percent are Black. This is better than in the mainstream media, where whites account for 84 percent of staff in newspapers and 76 percent of staff in digital news operations, but these numbers should come as an enormous disappointment, both to the public and to the funders of these operations whose leaders are entrusted with developing a more responsible alternative to corporate-run news operations.